Salomon Contemporary - Elissa Goldstone: To Win the Big Game!!! To Win the Big Game!!! Salomon Contemporary presents Elissa Goldstone: To Win the Big Game!! 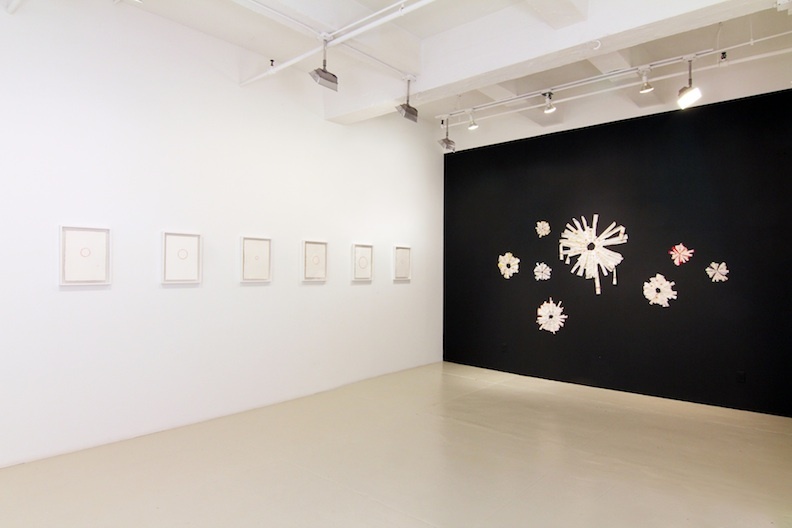 !, a solo exhibition of works on paper and intimate wall sculptures that blend two American pastimes - baseball and quilting. The artist employs fabrics, thread, and other fiber materials and techniques as a means of portraying both sport and craft. The pastimes are handed down from generation to generation through playing stickball with dad, or observing the handwork of mom; and consequently, one is overtly more masculine, and the other more feminine. Despite their differences, these traditions are structurally similar as their foundations rely greatly on geometric forms. In a quilt, the triangles and squares are used for their emotive or narrative abilities, while in baseball, the shapes - diamonds, circles, lines - define the rules and objectives of the game. Quilters and players practice consistently to achieve a high level of perfection. In To Win the Big Game!!! Goldstone defies these laws of excellence, and finds beauty not in the precision - but in the imperfections. Goldstone's process is meant to contradict the usual practices of textiles, thus the geometric embroideries in her works on paper appear slightly askew. And while quilters use pins to temporarily secure fabric before a stitch is made, in fireworks the artist substitutes thread with the somewhat precarious but elegant pins. Excitement is evident in the vibrant fireworks that visually render the feeling of accomplishment - a burst. Whether it's the finish of a detailed hand-made quilt, or the ninth inning, the exhibition revels the truth of that amazing feeling you get when you win the big game. Elissa Goldstone lives and works in New York, and has a B.A. from Bard College. Goldstone uses materials and techniques associated with traditional quilting to create delicate textiles and drawings. Her work plays with the geometric forms of board games, quilts, and sports as a means of exploring popular pastimes. 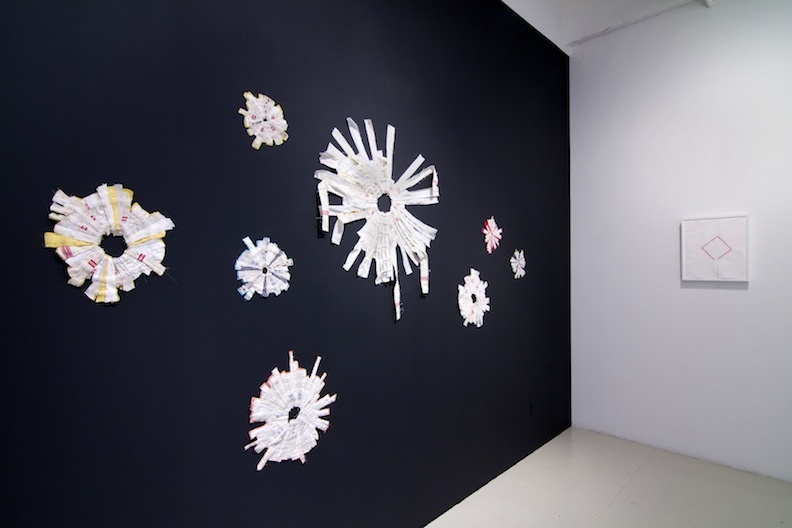 Her most recent exhibitions include Textile Show at Gallery onetwentyeight in New York and Tokyo and Make Yourself At Home at 7Eleven Gallery. She is also the co-author of a series of five zines, each focusing on a different aspect of baseball and the beauty, simplicity, and joy of the sport. The first of the series, Sports Illustrated was released in April 2011 and the second, People Magazine, in June 2011. Recent commissions include America Now and Here's Artist Corps curated by Maggie Mull in March 2011. This is the artist's first solo exhibition.